Say "cheese!" My parents on their wedding day. Lorna’s parent’s marriage endured a little over six years; they produced exactly three daughters. 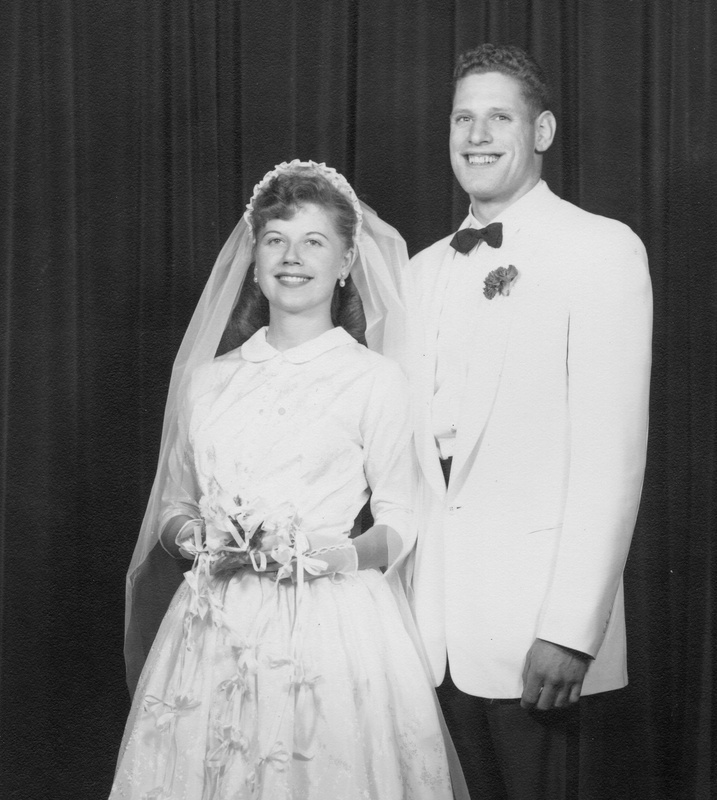 In June, 1955, they were married. Bobby got a blue-collar job in New Jersey, so he took his bride away from the only family she had ever known. They lived in a two-room apartment. He was gone more than he was home, but he was home long enough to produce Daughter #1, who was born in March, 1956. Mom was lonely and the apartment was cramped, so they moved back “home” to upstate NY (the part of NY state close to the Canadian border, not just the swath of land slightly north of NYC). 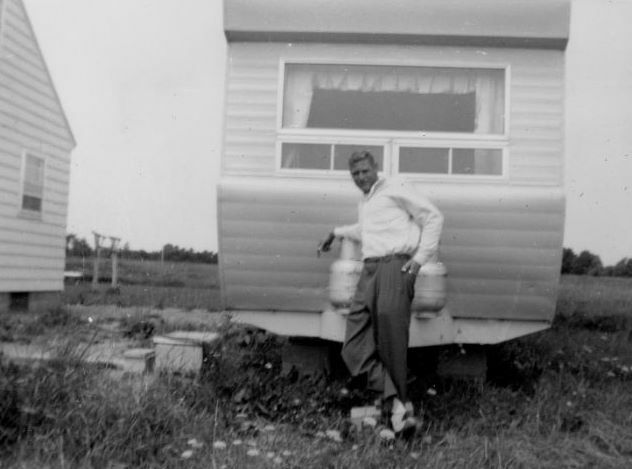 They bought a mobile home and parked it next to Carl and Maija’s home, which was out in farm country. Bobby’s parents wouldn’t have tolerated a metal monstrosity, no matter how small, next to their home; they were a proper family in a proper neighborhood. My dad got a job as a truck driver, which took him all over the region. Mom was without her husband for long periods of time, but at least she had her mother and step-father to keep her company. My mom got a little dog to keep her company too. She also got a little pregnant again. With me. Maybe it was the responsibility of a blossoming family and the financial burdens he faced or maybe it was in his nature to go wack-a-doodles and A.W.O.L., but he began to drink more, have fits of rage, and disappear without warning shortly after I was born. I’d like to think it wasn’t me. I was such an adorable baby and Tina was a simply beautiful child. He had every reason to be proud of his family, but he didn’t act that way. He returned home one day and got angry at “Bubby” (the little dog) for some minor infraction, barking too much or peeing inside, and took the dog out back at shot it. Dead. He was drunk and armed. Tina is on the right. She should have been a ballerina. I'm the happy cute pudgy kid stuck to her arm. I should have been a comedienne or poster-girl for Pillsbury. Mémé loved dogs and I think this upset her. It wasn’t long until our home became mobile and we moved about an hour away, on our own piece of property in the woods. 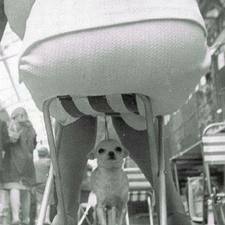 Without the watchful eye of his in-laws, Bobby’s behavior deteriorated. He drank more but also stayed away more and for longer periods of time. He changed jobs a lot, too. My mom called him “a jack of all trades and master of none.” His last job was a stab at his own heating and plumbing business. I know because he had pads of receipts made up–the same receipts he wrote his “Last Will and Testament” and suicide note out on. I suppose the pads were in his truck’s glove compartment and handy when he made his final decision. When he was “up,” my dad was the most generous, friendly man around. My mom also said of him, “He would give the shirt off his back to a stranger if the guy needed it. He would also spend his paycheck buying everyone drinks and forget I needed money to buy food for the family.” When he was “down,” he was dangerous. I already wrote of my memories of him: a few good memories and one really bad one. On a cold late February night in 1960, my mom went into labor for her third, and last child. He was there to take her to the hospital, but insisted on driving around until after midnight so he wouldn’t have to pay for an extra day of hospitalization. He dropped her off in heavy labor and left town. Mémé and Pépé were there to tend to Tina and me, visit her in the hospital, and take all of us back to our trailer. There had been a significant snowstorm during her stay. Proof of Daddy absence greeted us when we arrived home: a driveway full of snow. No one had been there to plow or shovel. 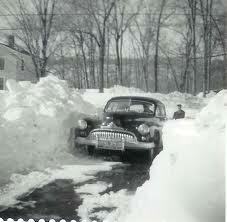 Pépé did what he could to make a path to the trailer while all the women and children stayed in the car. The driveway was long and hilly. Okay, but how about the path up to the trailer? Keep shoveling. There's got to be a trailer up there somewhere. I don’t remember this because I was only a little over two-years old, but we all trudged up the snowy hill to our cold home. Probably my grandparents went shopping for some fresh food and then left us to go back to their home, exhausted themselves. My mom told me, “This was supposed to be a happy day. I was bringing home my new baby girl. But I sat holding Lisa, with you girls around me and couldn’t stop crying. Where was my husband? Where had he been all this time? What was I going to do with three girls and no money?” She felt more alone than she ever had in her life with her three children clinging to her. My mom really wanted a son. She never got one. Two years and one month later, Bobby–my Daddy–killed himself. Or rather, he saved us from himself. When talking with my mom about her memories of this time, she told me something that, at first, shocked me. Upon reflection, I understand it completely. “How did you feel when the State Troopers came to your door and told you that Daddy was dead,” I asked her. I'd say that's a good representation of the kind of stress she was under. I was too young to understand his death, or so my mom decided. The whole thing, funeral included, was kept from us. Daddy and Husband faded from the notion of “family” until “family” became defined as Mother, Sisters, and a Mémé and Pépé. And a Me. My dad's parents, siblings and their spouses after the funeral, minus my mom. They're smiling. Did the photographer ask them to "say cheese!"? And what about Lorna’s little “family?” What happened to them? You’re welcome. But this part is really their story, too. A difficult write, dear Lorna. I can relate on so many levels but this is your life. Your Mother was and is a strong woman who raised three very strong woman. You being the only one I blog-know. I know you are a very strong and determined woman. You know they say,”That which doesn’t kill us makes us stronger”. I am glad that you have made your peace with this. It is never healthy to stay stuck; especially, in the past. Thank you for sharing your very sorrowful story. I’d like to think I’m even half the woman she is. Thanks so saying so! moving and honest. I love your writing, thank you for sharing. Seems like you got a good dose of your Mom’s genes – you are one strong woman. Perhaps. He was certainly, for all accounts, a very different person when he was drunk. As I was re-reading the words I wrote and you copied and pasted, I almost didn’t recognize them. I think this story is being written through me. Have you ever felt that way? You’ll find out as you read along…I have about a dozen more posts to bring this life story of mine full circle to when I started (teen who wants to please boyfriend and develops alcohol addiction). Everything will be revealed, my friend! How in the world you’re managing to write this from a bird’s eye view, I don’t know. The thoughts your mom had after the suicide feels heavy and light in one breath. All the frustration she had with his absence, gone. But was there a different kind a frustration for her behind it? A sort of confounded feeling, being a foreigner, wife and mother? What did happen with the family? Did your mom remarry? “This was supposed to be a happy day. I was bringing home my new baby girl. But I sat holding Lisa, with you girls around me and couldn’t stop crying. Where was my husband? Where had he been all this time? What was I going to do with three girls and no money?” She felt more alone than she ever had in her life with her three children clinging to her. I remembered Washington Irving … “There is a sacredness in tears. Sad story. Sound like he was bipolar. I know I keep saying this, but it’s true. I wasn’t sure if this was even going to be an effective post. This story was very difficult to write, emotionally, I mean. I’m so glad that I wrote it well, or at least effectively. Thanks for the feedback. I really rely on these comments. Yes, he was prone to violence when he was drunk. I’m sure we would have been abused had he lived. It was only a matter of time. He must have recognized that, too. For that, I thank him. This was such a tough story to tell, I wasn’t sure I was telling it effectively at all. Thanks so much for reassuring me that I did alright with it! When I was younger, I was full of anger toward my dad when I heard these stories. Now I, too, am sympathetic toward him. I see him as a very troubled man who wasn’t fully responsible for his behavior. Yes, he made bad choices, but with a limited set of tools from a very difficult childhood. I know in my heart that, as a family, we were all better off without him than if he’d continued to live. That may seem harsh, but in taking his own life, he saved ours. That’s the plan, Jamie. I’m developing the core of the memoir here and will organize the manuscript after I’m finished with, oh, about a dozen more posts. Yes, Debbie is gone from my life and has been for quite some time. A blip, really. I hope she found at least some answers to her questions. I have questions that remained unanswered, too. But she can’t answer them for me. We have different roads to travel. But I haven’t lost my sense of humor about my life. Don’t worry! It shall return! High praise indeed–no only about the way I presented the story, but in the therapeutic effect it had on you. I’m putting my life story (and my family’s story) out there for the very reason you describe: none of us are alone in experiencing pain, but it doesn’t have to define us. Thank you for sharing your comment with me. It’s hard to know what to say after reading something like this. I admire the courage you show in putting your story out there. You don’t seem bitter and you haven’t used your personal tragedies as an excuse for your own mistakes and I think that’s what I admire most of all. This was told elegantly, beautifully & sadly . I felt like I was right there witnessing everything. It also reminded me, that everyone suffers hardships they can pull through. After the terrible year I had it is sometimes easy to forget bad things happen to everyone & that I am not alone in the pain that is just life. So thank you for sharing. This was a tough one for you to write, Lorna. The toned-down style says it all. My heart hurts a little right now. The sad life that your dad led is tragic, but what a wonderful mom. You were three lucky girls in the end. I also cannot imagine the strange wonder at finding out you have a half sister as well… someone not of your mother… that instantly creates a wall towards them, and yet they are still part you… so strange to face. You are very brave to have written her and very compassionate in giving her what you did know… because all in all it was no more her fault that she had your father than it was yours… yet she is still an outsider. You tell this part so well. I must confess I am anxious to see if she remains outside even until today. This and other essays to follow should really be transformed into a complete, cohesive memoir. It would really reach and speak to a great number of people. Amazing stuff from one tough lady. I admire you!! Beautifully written, heart squeezing prose. Lorna you have a gift for bringing your reader right into the moment. I’m so happy your family survived your father. I can’t imagine the abandoned feeling your poor mother must have felt being brought home from the hospital with a new baby and no husband anywhere around for support. Bless her heart. You’ve shared about the hardship your father endured while growing up, so my compassion is with him too in spite of his brutal actions. Easy for me to feel, right? I didn’t live it and I don’t have the memories that you do of knowing your father committed suicide. I think you come from very strong stock (women in particular), Lorna. Do some people just automatically smile when a camera is pointed at them… I guess so. I clicked “like” even though it is a strong and painful story. But in the end, you survived — you and your sisters and your mother. That’s what we do, isn’t it? We women? We survive. Beautiful, poignant story. Thanks for telling it so beautifully. Lorna – beautiful writing of such raw and powerful memories and events. Thanks so much for your supportive and honest comment. The whole point of these stories, this blog, and eventually the memoir based on these stories is to share my story so that others will see how an ordinary person can live through tough times and come through them not as victim, but as a wiser kinder person. Thanks, Jacqueline. 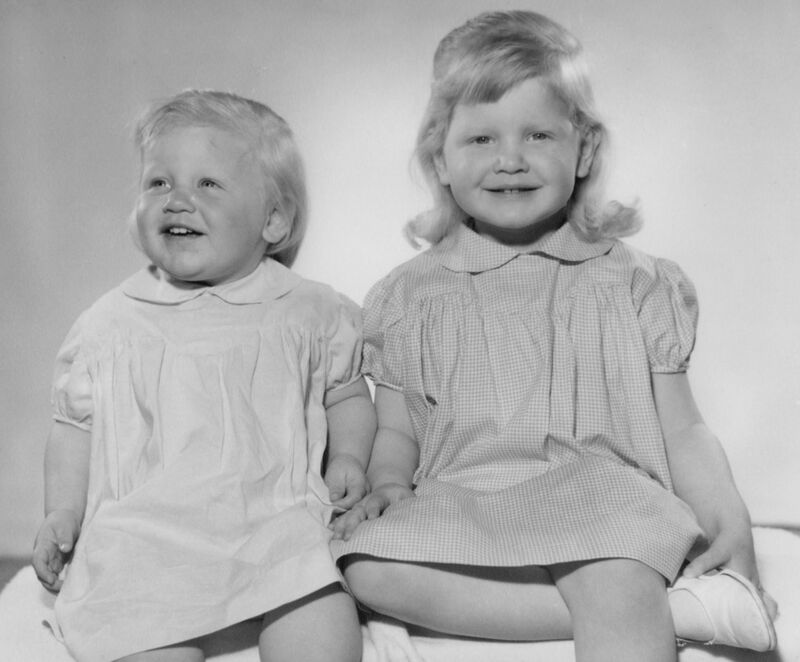 As I started writing my stories over 10 years ago, I realized “Little Lorna and Lorna Now” can’t really be separated. I’m glad for that. Little Lorna has a voice that I’ve grown quite fond of. I too feel I can’t click the ‘Like’ button, but this post deserves a 5 star rating. I never cease to be amazed by the depth of your memory. You have a very magical way of weaving the adult Lorna with the little Lorna – quite unique. Brave writing here – I take my hat off to you. Thank you for sharing this. Yes, your Mom is amazing! And so are all of you, Tina, Lorna, and Lisa. I’ve got to hand it to the women in your family – tough as nails. What a difficult and painful situation your mother had to endure. She is such a lovely bride. And yikes! 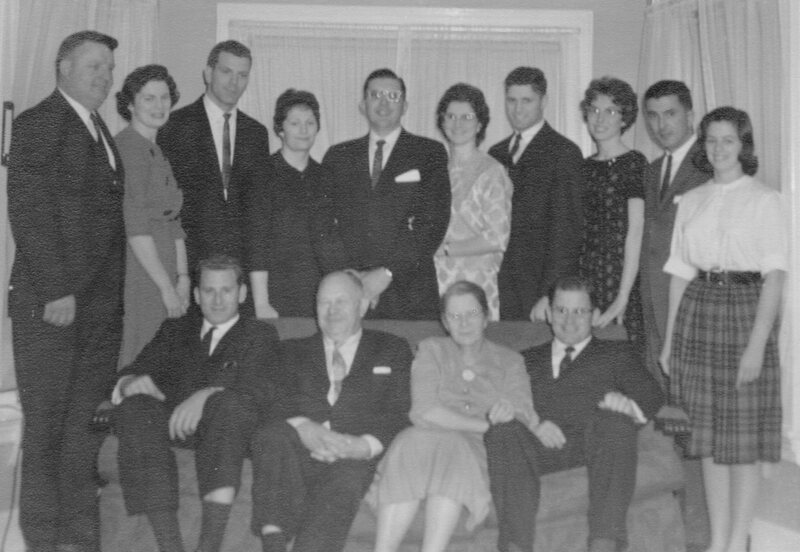 The picture of your Dad’s family all smiling after the funeral is odd and a bit creepy. After I read this, I sat… still for several moments… recalling moments in time where I have felt like your mother must have felt. Like I know she felt. I have also been the child like you… with the mind full of questions. It amazes me the strength of women throughout time as we survive… the men in our lives. Survive the people we encounter. It’s amazing that we are the sweeter of the two genders. Seems we have all the reason in the world to be cold and calculating and on some Lifetime rerun after going mad. I cant click the like button for fear of offending you and yours, it looks like your mom and your family are survivors, pure and simple it is not a now-a-day curse of alcohol, or lack of money, but we all have to find our modes of surviving.